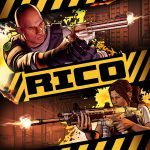 The visual style of Rico caught my attention. I read the story behind the pitch, how it really was around 1,000 words but it could be summed up in four. “Kick doors, shoot dudes”. At that point, I am in. Big time. That is what Rico boils down to. If you know nothing else, know that you’re going to be kicking in a lot of doors, and shooting a lot of dudes. There’s a crime syndicate and you need to take it down. You do this by the aforementioned door kicking and dude shooting. What it doesn’t tell you is that it uses mechanics of a rogue like, and this works very well indeed. Starting off with just a pistol, your first level is basic. As you succeed, based on completed objectives you are awarded with points to which you can upskill your character. Armour, health, weapons and ammo are on offer allowing you to customise your play through to your style. In order to solve the case (which is a map of various missions) you need to make it to the end – fail, and you’re dead, having to start all over again. Nothing persists so you really do need to start from scratch. Adding to this though and helping the variety is the fact that the levels are randomly generated – so you can’t easily speedrun objectives as elements are in different places. The game is actually well designed to be played in co-op too, adding to the door kicking and dude shooting fun. To counter this for solo players, you get an element of slow motion kick in as you break down each door to enable you to get a bit of a headstart on the baddies, to counter a slight reduction in co-op tactics. 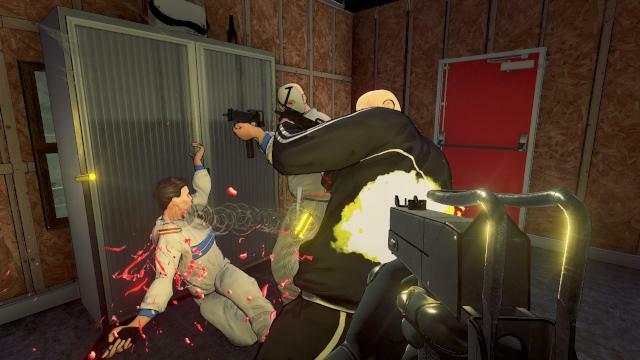 Door Kickers this is not – which if you haven’t played it, check it out on PC/Mac or iOS, as it’s amazing. Tactics are little more than move and shoot. Unfortunately, and here’s the downside, this doesn’t work that well. The basic elements are there, but the aim acceleration is completely off. It’s near impossible to effectively navigate the harder levels with a controller. Whether this is poor optimisation (or experience) on console it’s unclear, but it limits enjoyment and ability to see it all through. It’s such a shame. Rico is a simple game, but the concept is set to work brilliantly. But when you double down on one element, you have to make sure that element is absolutely perfect. And it isn’t. The cell-shaded cartoon style with over-the-top violence is brilliant. The dialogue is hilariously cheesy and it all just comes so close. But despite adding in online co-op, leaderboards, daily challenges… being unable to hit someone in a clutch play because the aim acceleration is all over the place. Well, it’s just one case not really worth solving.